Learn more about the first ever UN resolution on the protection of women human rights defenders adopted by the UN General Assembly in December 2013, advances made since its creation and the obstacles to, and good practices in providing protection to defenders. Sponsored by: Association for Women’s Rights in Development, Permanent Mission of Norway to the United Nations, Office of the High Commissioner for Human Rights, Permanent Mission of Tunisia to the United Nations (TBC), Amnesty International, International Civil Society Action Network, Just Associates, International Service for Human Rights and Women Human Rights Defenders International Coalition. Join the Women Human Rights Defenders International Coalition to talk about human rights documentation of and for Women Human Rights Defenders. We will discuss ‘good’ gender-sensitive documentation and explore key issues, challenges and politics of documenting our activism and the violations we face. 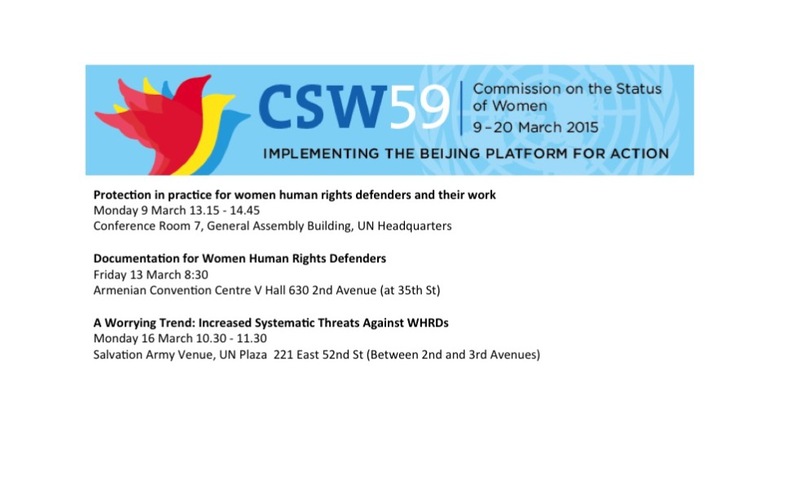 The event will provide a crucial opportunity to reflect on the key role that Women Human Rights Defenders are playing in the implementation of the Beijing Declaration and Platform for Action at the national level, as well as the countless restrictions and violations they face because of who they are and the work they do. The panel will also provide a venue to discuss concrete measures that states need to take at the national level to ensure effective protection for WHRDs and safeguard their rights to freedom of association, assembly and expression. Sponsored by: Association for Women’s Rights in Development, MADRE, CIVICUS, Women Human Rights Defenders International Coalition, Amnesty International and Urgent Action Fund.